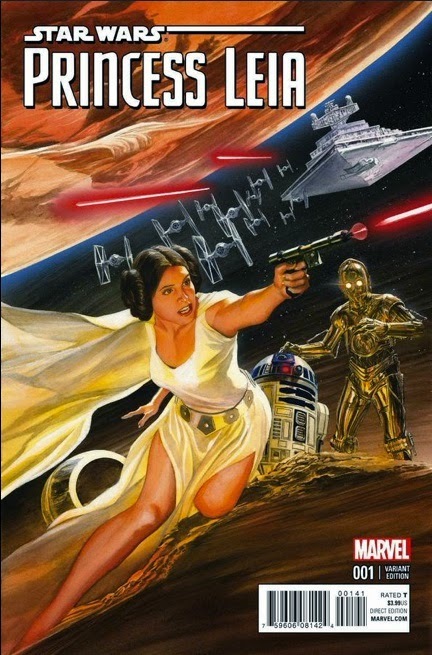 Spurred on by the destruction of her home planet and the continued tyranny of galactic oppression, the Rebel Alliance couldn't have a better leader to fight their cause than Princess Leia Organa. The plucky and resolute icon character's all-new comic book adventures begin this month in a five-issue limited series from MARVEL. BEHIND THE SCENES: ARE WE DREAMING THIS? CLASSIC ART: A DISTANT GALAXY, A DARING MISSION! STAR WARS REBELS: 'FULCRUM' REVEALED! CLASSIC IMAGE: ONE DOWN, TWO TO GO! AN 'EMPIRE' AT 35: DON'T MESS WITH A PRINCESS! CLASSIC IMAGE: JAR JAR MEETS THE DROIDS! BEHIND THE SCENES: OUT OF THE TRASH COMPACTOR! CLASSIC IMAGE: FISH OUT OF WATER! DELETED SCENE: HIDING IN PLAIN SIGHT! CLASSIC IMAGE: ANAKIN AND THE NEXU! STAR WARS REBELS: THE TYRANNY OF TARKIN! CLASSIC IMAGE: "A SITH HERE?!" A 'SITH' AT 10: STRIKE AND COUNTERSTRIKE! EPISODE VII: RACING TO DESTINY! ILM CLASSIC IMAGE: PHIL'S STOMPING GROUND! THE CLONE WARS: DOOKU'S DELIGHT! AN 'EMPIRE' AT 35: TARGETING THE FALCON! MADAME TUSSAUDS UK UPDATE: OUR HEROES TAKE SHAPE! A 'SITH' AT 10: GRIEVOUS GETAWAY!